11 I am the good shepherd; the good shepherd lays down His life for the sheep. 12 "He who is a hired hand, and not a shepherd, who is not the owner of the sheep, sees the wolf coming, and leaves the sheep and flees, and the wolf snatches them and scatters them. 13 "He flees because he is a hired hand and is not concerned about the sheep. 14 "I am the good shepherd, and I know My own and My own know Me, 15 even as the Father knows Me and I know the Father; and I lay down My life for the sheep. 16 "I have other sheep, which are not of this fold; I must bring them also, and they will hear My voice; and they will become one flock with one shepherd. The Good Shepherd - who is He? What is His characteristics? That ought to be important for you to know after all, when it is truly in Him alone there is salvation, and no other, in the whole existence elsewhere. His characteristics are, above all others (that implies - if they are lacking, or are shoved in the background, it is not The Good Shepherd you are dealing with), Jesus makes clear for us here: He "lays down His life for the sheep." (v.11b and 15b). That shall recognize Him. "He is known by the wounds, He got for the sheep." This Good Shepherd was the one Paul was travelling about in that ages pagan world (the other sheep v.16), to preach too. There is no doubt about that from what Paul so marked underlines on several occasions: "you, before whose eyes Jesus Christ was publicly portrayed as crucified." (Gal. 3:1b). And: "...I determined to know nothing among you except Jesus Christ, and Him crucified. " (1 Cor. 2:2). It is the crucified Jesus Christ who is the Good Shepherd. This recognizes Him, and this is the infinite consolation, encouragement and continuously fount to hope and faith and joy, to all poor sinners who have the Spirithrist. Such is He revealed, and kept alive unto their heart, by The Holy Spirit, and such is He revealed in the heavenly sanctuary before the throne of God: "I saw between the throne (with the four living creatures) and the elders a Lamb standing, as if slain." (Rev. 5:6). It is the crucified Jesus Christ that is revealed before heavens throne, in our place - His wounds and His blood speaks our case, and keeps us in an eternal spiritual fellowship with the Father and the Son. "Completely covered in your wounds, from where the blood was flowing, saved by grace I blessed stand, in the midst of all my need." (Norw. songbook). It should be reasonable clear to us, that this certainly is completely uninteresting and absolutely incomprehensible - yes a clear offence, unto that person who has not - by the light of Gods word - been revealed as a sinner before God. One can often hear the prayer: "Let your grace become really great and inalienable to me." "Let me see your grace clearly," and so on. But what answer do you expect on a prayer like that? How shall this come to pass? Have you thought of that? In reality it is just in one sole way this can come to pass. If Gods grace shall become really great to you, you must become a really great sinner. That is precisely what Jesus calls attention to, when He speaks about the sinful woman in Simon the Pharisee’s house: "For this reason I say to you, her sins, which are many, have been forgiven, for she loved much; but he who is forgiven little, loves little." (Norw. transl. : Her many sins are forgiven, that is why she loves so much)" (Luke 7:47). Jesus won't have said by that, that it exists any human being who needs little forgiveness, because every human being stands in an inestimable debt towards God because of his sin and infidelity, but some are, in their self -righteousness, seeing it like that - as e.g. the Pharisee Simon. But also "righteous" Simon could only enter into Gods Kingdom on the price that is called the blood of the Lamb. As this was about to reveal unto his heart, he would have realized that "my sin must be great." So you do not need to live the life that is clearly sinful to all - as it usually is called - to be a great sinner. You just need to see some of what already lives in your heart, in Gods light. Some have always bent down for this revelation, and then both the sin and the grace have become big, others have taken offence exactly by this, and turned their backs to all that is called Christianity, or chosen another and to them a "better" Jesus. 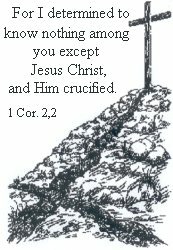 But all because of the offence on the truth: "He was pierced through for our transgressions." Something God never has meant to judgement for any human, but on the contrary, to their salvation. Nevertheless it becomes to judgement for so many, because they, in their self-righteousness, reject it. It is accordingly mans self-righteousness that shuts them out from Gods Kingdom, and never apparent sin, as we generally think, before we get Gods light over it. Because in the same hour that an apparent sin, is acknowledged as sin, in the same hour it is also seen as paid for on the cross. But if you justify and overlook a sin, what is it other than self -righteousness? "It is not the sin in itself that is dangerous (because that is paid for), but what you do with it," has a well-known preacher said. That is - right understood - quite right! Because now this is The Good Shepherd - He who gives Himself for sinners - we see in Israel where Jesus stood forward, that harlots and tax collectors and sinners of all kinds kept close to Him, while the "pious" were scattered like husks for the wind, in their implacable and bitter hatred towards Him who would not accept their piety, but on the contrary told them that tax collectors and prostitutes are going ahead of them into Gods Kingdom. Clearly they had to go ahead of them, when the entrance is atonement-blood! The highest in heaven are throwing their crowns down before His throne (Rev. 4,10), and these people will accordingly not let go their piety, but keep it on, before the three times holy God! Jesus - and The Scripture - won't thereby glorify a life in sin and wretchedness. The most who do so get certainly neither saved, nor get any life to "sing songs of joy over" in this world, neither is He despising an upright life - we are now gradually seeing the contours of a society where constantly fewer bother about uprightness, and who desires this? But whoever that wants to calculate on a drop of his uprightness, in what concerns God and His salvation, he is lost by that, i.e. by his self-righteousness, which in Gods eyes is only sham and lie. "All have sinned and fall short of the glory of God" (Rom. 3:23), but "they who seek the LORD shall not be in want of any good thing." (Psalm. 34:10). Any! Jesus as the good and right Shepherd He now is, fought and gave Himself for the sheep: "So if you seek Me, let these go their way!" He said when His persecutors came to apprehend Him. (John 18:8b). Such a heart Jesus has towards you too. He wants that you shall go free, therefore He gave Himself - solely therefore! The hired man is only taken up with what benefit he can have of you, either as a visible "proof" of his own spirituality and fear of God, i.e. prestige (Gal. 6:13), or economic gain. (2 Pet. 2:3 and Jud. v.16). "I am the Good Shepherd, and I know My own and My own know me." (v.14). "My own know Me," says Jesus here, "as the Father knows Me," He adds. And how? That Jesus is saying in the same run: "I lay down My life for the sheep." Such is He known by His own, and such is He known by the Father. He and the Father is one. (John 10, 30). God is the Good Shepherd - God is the one who has given His life for us! Comprehend this whoever can, but such is He revealed among us.